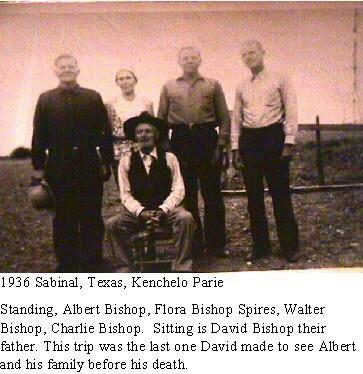 Comments: David Bishop (Nee: ) | Sabinal TX USA | 1921-1940 | Comments: 1936 Sabinal, Texas, Kenchelo Parie, Standing: Albert Bishop, Flora Bishop Spires, Walter Bishop, Charlie Bishop. Sitting is David Bishop their father. This trip was the last one David made to see Albert & his family before his death.